I liked The Unchangeable Spots of Leopards from the first page because the synopsis made it impossible to tell what the book was about and I found myself pleasantly surprised. I enjoyed the unique format of the book a lot as well. This novel is an interconnected set of short stories that follow some characters around and the story progresses with gaps between each story which don't distract from the important parts. That is to say that even if the story doesn't flow from day to day, it is still easy to follow along and not feel like anything was missed. There were, however, some short stories that I found less interesting than others. The characters are all creative types, and when the author went into too much detail over the creative process or a detail like getting published, I felt my eyes start to glaze over. I am not sure why it seems to be so a la mode these days to write about writing but I don't find it to be an interesting plot twist in the least. 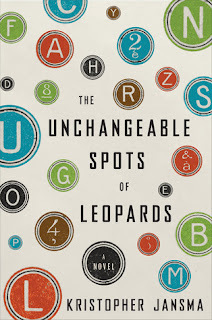 All in all The Unchangeable Spots of Leopards is an interesting book set all over the world that has great detail and really made me feel like I was traveling in different countries and times right along with the characters involved.